Food is a basic human right and a major driver of Californias economy. And yet, the current food system produces low wages and hunger, and is a major contributor to climate change and other major environmental issues. Hear your future State Assembly member, Jovanka Beckles or Buffy Wicks, address these important topics at a candidate forum on food in Californias 15th Assembly District. Learn about the candidates perspectives on the intersectional topics that impact our work and lives, like access to healthy food, food workers rights, and agricultures impact on the environment. 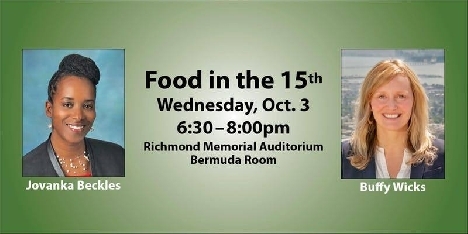 Food in the 15th is a moderated forum with prepared questions from the events hosts, followed by moderated questions from the audience. Click here ( http://findyourrep.legislature.ca.gov/) to see if youre a resident of State Assembly District 15.